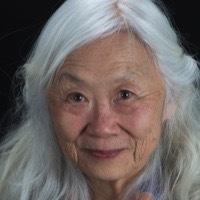 Maxine Hong Kingston is a Chinese American writer whose books include Tripmaster Monkey, China Men, and The Fifth Book of Peace. Her first book, The Woman Warrior: Memoirs of a Girlhood Among Ghosts, was published in 1976 and blends autobiography with “talk-stories,” her mother’s mystical tales of China. In her memoir I Love a Broad Margin to My Life (2012), Hong Kingston reflects on 65 years of life, from her childhood in California through her activism during the Vietnam War to her arrest during a 2003 peace demonstration at the White House. Her book Hawai’i One Summer is a collection of essays about her time in the islands she called home for 17 years. Hong Kingston is currently senior lecturer emerita at the University of California, Berkeley.